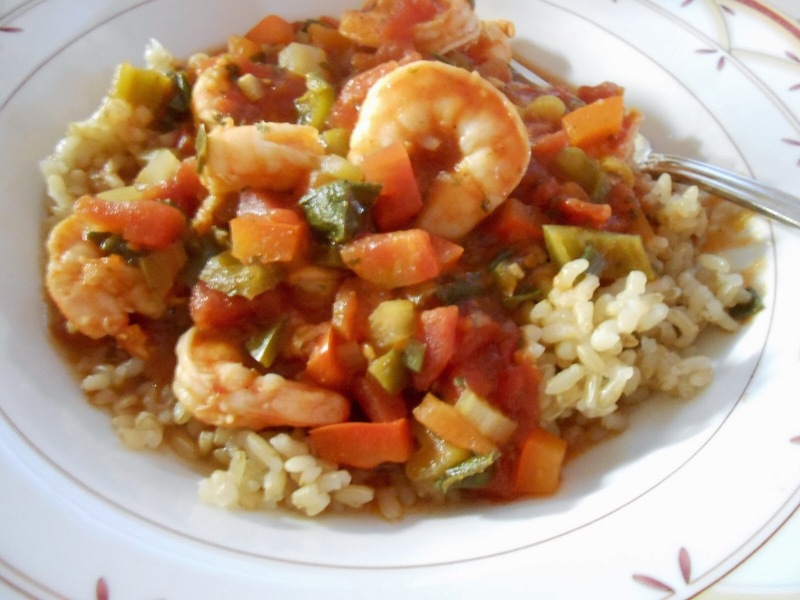 If you need a great, quick and easy meal for Mardi Gras, this Shrimp Creole dish is an excellent one! For guests who like more heat, you can provide some hot sauce for their spicy taste buds. This recipe comes from The Dallas Morning News by guest columnist, Ann McCann. It is colorful and has wonderful texture and flavor. I hope you give it a try! Heat the oil in a large sauté pan and sauté garlic until soft. Add bell pepper, celery and onion and cook until translucent. Add tomatoes, tomato sauce, seasoning and Worcestershire sauce. Simmer 10-12 minutes. Stir in parsley and season to taste. When ready to serve, add shrimp (partially thawed if frozen) and simmer on medium-low heat until shrimp are fully cooked and pink, about 6 minutes. Prepare rice according to package directions while the shrimp cooks. Add a few drops of Tabasco. Serve in warm bowls over rice with Tabasco for additional seasoning. Note: If using cooked shrimp, heat only long enough to warm the shrimp. Kitty, I find myself drooling over every single one of your posts. I love shrimp creole and this recipe sounds so good. I am wondering what Mr. Bear had to do to get those beads - I am sure that he will never tell - lol!! 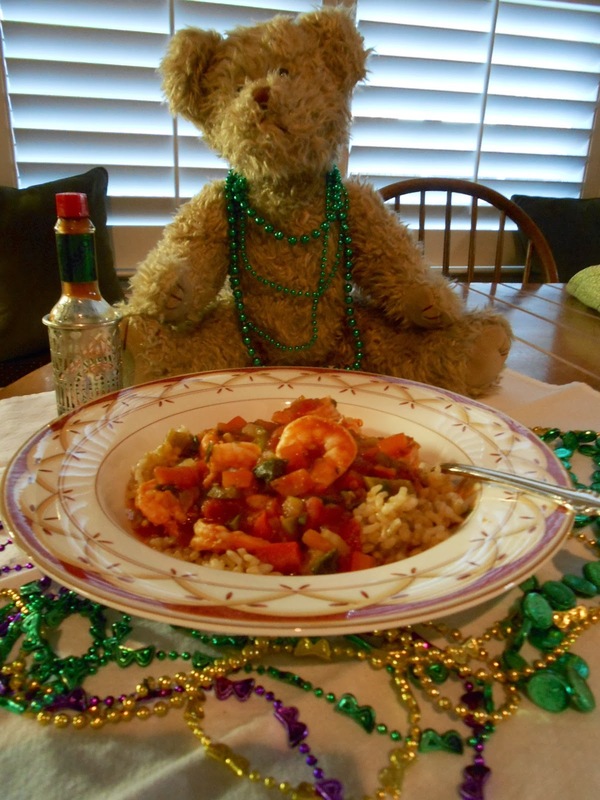 Kitty, your Shrimp Creole looks DELICIOUS!! I love the fact that all your recipes look delicious, but they don't look ridiculously hard to make. That makes them even more appealing for the majority of us who just don't have hours and hours to cook a meal. Your Mardi Gras colors are wonderful, and I love your little bear. He's darling. :) Happy cooking to you, my friend, and thanks for sharing the recipe!! Thank you for the shrimp creole recipe. It sounds delicious! I plan to make it for Fat Tuesday! I just love your blog, Kitty. Oh, yum! It's looks as pretty as it does tasty. Cute little bear ready with his beads, and love the silver sleeve on the sauce bottle. Where did you ever find it? I think this sounds so good. I always enjoy the recipes you share! This is so adorable. The little Teddy all dressed for Mardi Gras.. The shrimp creole looks delicious. I do love a good shrimp recipe. Thanks for sharing your recipe and for visiting me. I do appreciate your sweet words. Dear Kitty, everything you cook is so beautiful and I know it all tastes so good. You are really a great cook. Just realized that though my mother makes a good shrimp creole, I have NEVER made it. That's pretty lame because I happen to love it. Need to rectify that. I'll start by pinning this. You make shrimp sound good to me and normally I am not a shrimp girl :) This looks quite tasty! And your table setting is just too cute! Hugs to you, my friend! Yum! Its looks attractive and tasty, charming tiny bear ready with his bead, I think, if you do something then must do them without hesitation. It is built up the self-confidence and you can start a better carrier. Your dish looks so yummy. I think I made this 20 some years ago. I need to give it another try! It looks so pretty with the beads. Dadgum it! I wish I would have seen this recipe before I printed up the menus for our Mardi Gras celebration next week!!! I would have MUCH preferred to do this as opposed to gumbo which is going to require standing over a hot stove stirring the stupid roux for what will seem like hours. For as much as we have going on that day, I really needed something less complicated but equally tasty that presents beautifully....and this is IT....four days too late!!! :-( Oh, well...I suppose there's always next year. I'm going to pin this one, Kitty. Thanks!!! It looks fabulous! That bear with the Mardi Gras beads is the cutest thing ever! Your Shrimp Creole looks delicious, great table setting. Thank you so much for sharing this awesome post with Full Plate Thursday and have a great weekend! Hi Kitty! I really love shrimp, so this recipe is calling my name! My husband can bring his own hot sauce (Frank's), because I like it mild flavored. Your photo is so lovely too, and colorful! Hi Kitty, I love shrimp and this sounds super yummy! I will be trying this soon. Thanks for sharing with SYC. What a delicious recipe, looks so good! I'd love to come to to dinner to dine with teddy!!! We LOVE Shrimp creole!!! It is one of our staples. Your recipe is very much like mine, I love the beads and Mardi Gras look!!!! Where in the world di you find the sleeve for the hot sauce! !